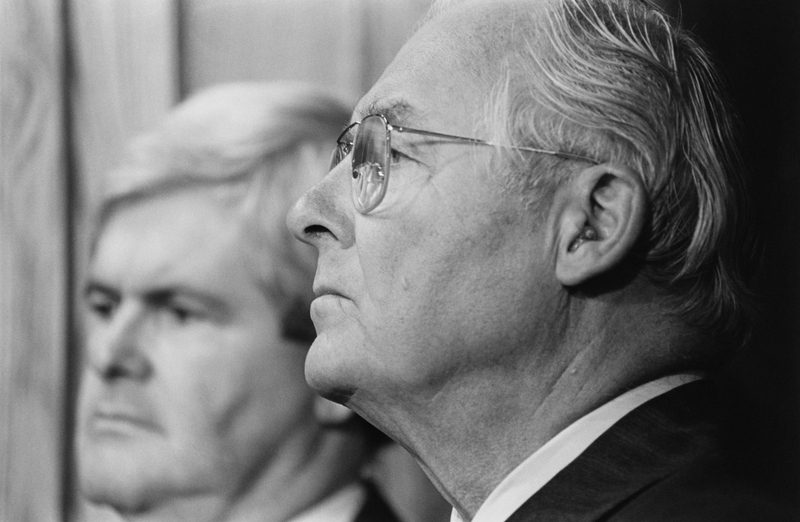 Robert H. Michel, who as the House minority leader from 1981 until his 1994 retirement became the longest-serving congressional Republican leader who never experienced majority power, died Friday. 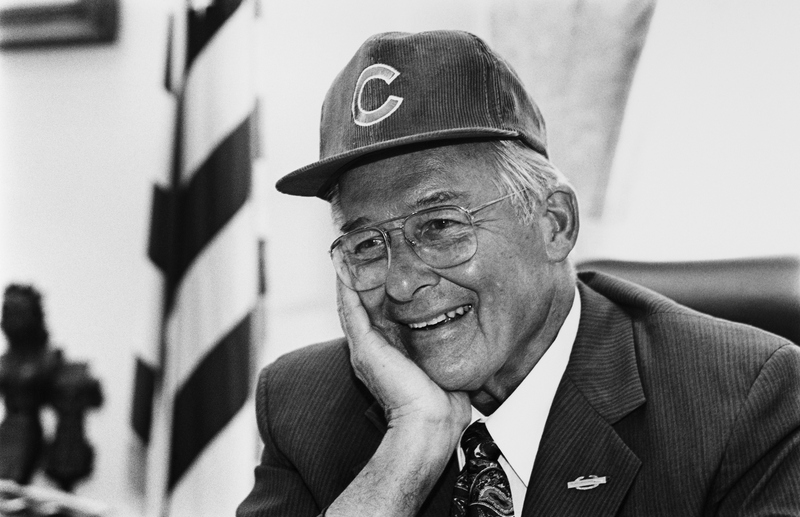 He was 93 and had lived on Capitol Hill much of the time since stepping down after 19 terms representing central Illinois. He could reliably claim to know that his brand of middle-of-the-road policymaking would play in Peoria — because that was his hometown. He was far more comfortable using his sonorous baritone to croon “God Bless America” at the Rotary Club than to parry with pundits on one of the Sunday shows. He didn’t have special policy expertise, particular oratorical gifts or unusual parliamentary skill, and his leadership style was neither overtly charismatic nor consciously intimidating. Instead, Michel (pronounced “Michael”) got what he needed from the GOP rank and file because he was a patient listener, a flexible goal-setter and gentle persuader. At 14 years, Michel spent more time as minority floor leader than anyone else since the position was created in the House at the end of the 19th century. He was minority whip for six years before that. Throughout his time in leadership, he remained committed to legislative compromise in the practical view that — so long as his caucus had fewer votes than the Democrats — appealing to the spirit of bipartisanship was the best way for his side to lay claim to a few crumbs off the negotiating table. By the early 1990s, it was clear the Republican Conference had become dominated by younger members who favored much more confrontational conservatism and much less Midwestern amiability. The decade opened with firebrand Newt Gingrich of Georgia newly installed as minority whip, having secured the No. 2 post by upsetting Michel’s old buddy from an adjacent Illinois district, Edward R. Madigan. Gingrich and his more partisan acolytes soon started steering Michel toward the door. By the time he announced his retirement, in October 1993, it was clear Gingrich was running for the top GOP job after the 1994 election no matter what — and that he was well on his way to assembling the votes to win. So Gingrich would likely have become the first Republican speaker in 40 years even if Michel had chosen to remain in office. Robert Henry Michel was born in Peoria on March 2, 1923, the son of a French immigrant factory worker. He spent almost three years as a combat infantryman in Europe, landing at Utah Beach on D-Day and earning a pair of Bronze Stars after he was wounded by machine-gun fire in the Battle of the Bulge. The fact that Michel “knew warfare firsthand” was a big reason his rhetorical tone in politics was so gentle, said former Transportation Secretary Ray LaHood, who was Michel’s longtime chief of staff and his successor in the House. Soon after graduating in 1948 from Bradley University in his hometown, Michel went to work for the district’s new congressman, Republican Harold Velde, rising to become chief of staff. When Velde departed after four terms — during which he chaired the House Un-American Activities Committee that hunted for Communist subversives — Michel benefited from his senior staffer’s insider political connections and won the five-way GOP primary in 1956 with 48 percent. That was tantamount to winning the solidly Republican seat, and after that, Michel routinely won re-election with about three-fifths of the vote. His most important campaign came in 1980, when John J. Rhodes of Arizona stepped down as floor leader. Republicans voted 103-87 for Michel, who campaigned as a legislative workhorse, over Guy Vander Jagt of Michigan, who positioned himself as the better political messenger. 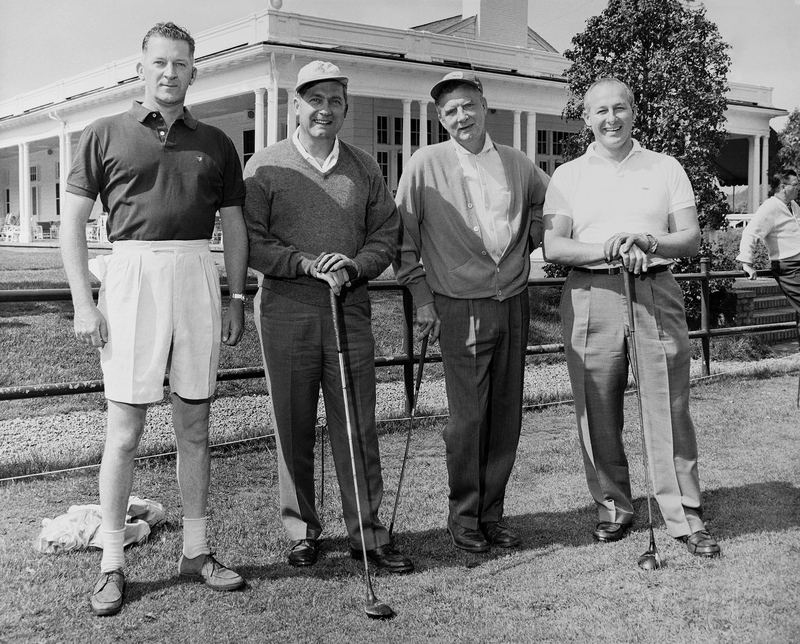 From the start of his Hill career, Michel was a firm believer that socializing with members of both parties over cocktails or a round of golf was one of the essential legislative lubricants. In the 1960s, long before swift and inexpensive airline travel started encouraging most House members to go back to their districts every weekend, Michel would share the wheel on long car trips back to Illinois for the infrequent recesses with Democratic Rep. Dan Rostenkowski of Chicago. Michel, while rising through the ranks on the Appropriations Committee, and his driving buddy, who was climbing the rungs at Ways and Means, would bide the time talking over spending earmarks or tax provisions that might benefit their state. The bond helped Michel put a GOP tinge on some of the important economic legislation Rostenkowski engineered as Ways and Means chairman in the 1980s. He was a longtime fulcrum in the somewhat secret society known as the Chowder and Marching Club, a group of well-respected House Republicans who donned chef’s hats and aprons for their piano-bar social gatherings, but which otherwise served as a discrete conduit for legislative intelligence, networking, mentorship and supporting colleagues through personal crises. Joining the group in 1950 allowed Michel to forge lasting bonds with two future presidents, Rep. Richard Nixon of California and Rep. Gerald R. Ford of Michigan. Michel was also a mainstay of the annual Congressional Baseball Game, which survives as a rare moment of bipartisan bonhomie to this day. He hurled a shutout in the 1962 contest — the first after the annual charity face off between Republicans and Democrats was revived by Roll Call — and his pitching helped the GOP dominate the game for much of that decade. He was among the first seven inductees into the Roll Call Congressional Baseball Hall of Fame in 1983. 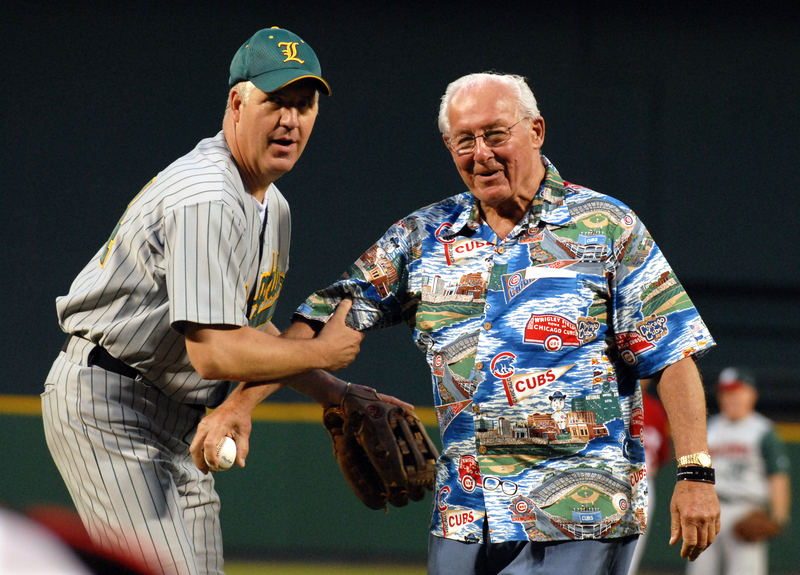 And well into his 90s, he rarely missed a game — clad in his trademark outfit of khakis and a tropical print shirt and prowling the stands at Nationals Park to glad-hand the crowd of lobbyists, staffers and nonplaying members. He was often seen at Eastern Market, the Arena Stage and the GOP’s Capitol Hill Club, where the cloakroom is named in his honor. His wife of 55 years, the former Corinne Woodruff, died in 2003, the same year Michel stopped actively lobbying for Hogan & Hartson (now Hogan Lovells), where he spent the first years of his life after Congress in a successful quest to see a doubling of appropriations for the National Institutes of Health. He is survived by two sons and two daughters.